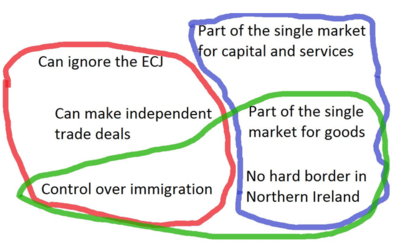 There are three types of Brexit, and each has its pros and cons. Which do you prefer? Option one is a Soft Brexit. This means everything from staying in the single market, like Norway, to a second referendum and no Brexit. The European Court of Justice’s decisions are binding. Option two is May’s Deal. This is a sort of halfway house. It has some of the benefits of staying in, and lacks some of the drawbacks. Option three is No Deal. This is a total break from Europe. Why isn’t there another option, one where the UK gets more of what it wants? Because that would involve taking things away from the Europeans, and they’re not willing to give them up. It basically boils down to sovereignty on one side, and trade on the other. More sovereignty is good, but so is more trade. More sovereignty means less trade. Take your pick. Last week I wrote about the three camps fighting this out. The first camp is the Prime Minister’s camp of pragmatic Brexiters. It wants option number two, May’s deal, the halfway house. This camp is mostly made of of moderate Tories. The second camp is the European Research Group of anti-Europe Tories. There’s somewhere between 70 and 100 of them. And they want option three — no-deal. There aren’t enough of them to pass anything on their own. But they have the power to block other camps from getting a majority. If they play their cards right, they could force no deal by blocking all the other camps’ plans. The third camp is the soft Brexit / no Brexit camp. They want option one. And it all comes down to them. They’re not as united as the ERG camp, or even the Prime Minister’s camp. But if they can all be corralled together to vote for one proposal — such as Corbyn’s soft-Brexit deal — they could win the day. There are 300-350 of them. The problem is that they’re a motley crew of moderate Tories, Labour, Lib Dem, Scottish National Party and The Independent Group. And they have no clear plan, apart from hating no-deal. Some want a people’s vote (and ultimately, no Brexit), others would stomach May’s deal, others want a Norway-style soft Brexit. Are you still with me? Good. Because it gets even more complicated. So there are three camps. And each camp wants one form of Brexit. But the key to resolving this is each camp’s second preference. The ERG camp want the following, in order of preference: 1. No deal, 2. May’s deal, 3. Soft Brexit. The soft Brexit camp want: 1. Soft Brexit, 2. May’s deal, 3. No Deal. The moderate Tories want 1. May’s deal, 2. ?? ?, 3. ???. Right now, each camp is fighting to get its first preference. But obviously each camp can’t get its first preference since they’re all mutually exclusive. As the clock runs out, there’ll come a time when one of the three options will become unviable. This could happen because, for example: Bercow won’t allow another vote on May’s deal; or because no-deal is incredibly unpopular with the public; or because there’s not enough time for a second referendum. And when one of the three options becomes unviable, the camp that supports that option is going to have to support a different option. And that’s when there could finally be a majority in the house for one of the options. For example: let’s say Bercow succeeds in stopping May from putting her deal to a vote for a third time. Now May’s camp would have a decision to make. Their favourite option is off the table. So which do they prefer, of the remaining two options? No deal, or soft Brexit? Or, if there was a lot of public support for a people’s vote. Would the hardline ERG gang hold their nose and vote for May’s deal? Or would they hang on? Or, finally, if the clock was running down to the cliff edge, and no deal was looking likely. Would the Soft Brexit gang crack and vote for May’s deal? This is what Brexit comes down to. Who’s willing to hold out longest. Who’s willing to risk everything to get what they want. The first side to compromise loses. Manafort Was Colluding… With Airbnb? I want OUT of the EU because._ They are hoping to have a common parliament to set the rules for all the EU members, -Pension rules ie retirement age, -Minimum wages, hours, etc,-Standard Vat, -an EU Army,- Control of all the Banks Interest Rate, Lending Regulations, Debt parameters. – ECJ of 27 countries all with different needs. A common currency, Independent parliaments, and free movement of peoples always failed. Negotiate tariffs on behalf of all the countries each with their own Goods and services to protect; ie 7 years for an agreement with Canada then a small principality held them to ransom. Open borders have been a disaster. Growth in Europe has almost come to a standstill, all trade is internal to the EU, and their external trade is declining., Whilst the growth is with countries with a younger population. As for the pending EU banks exposure to debt, we want to be well clear when it starts to domino. Offer the EU their choice = we have “the deal” without a backstop, Or” No deal.” Ireland North and South sort out the border it’s their problem, they may want to stay in the EU, technology can solve the problem (SAP) get a software company that develops solutions to these problems, not biased politicians it’s been done elsewhere. All the parliament discussions have been on what “They want”, not on why the public won’ted OUT. The EU has set the terms of our removal from their Un democratic union very unfairly in trying to keep us tied to their money grabbing coffers being one of the largest paying inputs into their unaccountable system. Why couldn’t they just have written into the terms of the uk leaving the union , well the uk people have decided democratically to leave therefore they will pay the divorce fee and we can agree trade deals separately amongst other services.they could have made dealing a lot easier but no made it hard for us to escape their clutches. Our own prime minister is at fault for not arguing the will of the people after the 2016 referendum which governments stated this is a once only chance to have your say no going back leave means leave and agreed in parliament no deal is better than a bad deal off the eu. Our mps have let down the 17.4 million people who voted out and it’s a pity our people are not more like the french who wouldn’t stand for it they would fight tooth an nail for their democratic right to carry out the outcome of such a vote if it had been in their country. Maybe we should have had a brexiteer prime minister and things could have been different. The EU only wants the UK for it’s money and it shows. Even when working with them the default when the UK wanted to change things for the better for everyone the answer was predominantly “Non”. It has been a one sided arrangement with an incompetent institution that has never managed to get it’s finances audited. Would you invest in a company that had their history ? If we do not leave they will continue to tell us what to do, force the Euro onto us, control our armed forces (only the UK and France has armies that actually work) etc. It will be the updated version of George Orwell’s 1984 and we all know that happened to the USSR when some people are more equal than everyone else. Cameron offered the UK a one time opportunity to stay in the EU as it is or to leave the EU before it gets worse but he assumed that we would choose to stay. He was wrong and we chose to leave. It is our future and we want it to be ours, not the EU’s. All our MPs voted to leave following a majority decision but they do not really want to and so we have this “dogs dinner” of deals, no deals revoke article 50 (pretend that we do not want to leave). Hopefully they will continue to make no decisions for a couple more days and we will leave the EU with no deal as that is the only option currently written into UK law. The next financial crisis may not start exactly the same as the last one, but almost the same. What makes anyone think a new referendum on the EU would finally put the issue to bed?